Pervious Concrete - What is Pervious Concrete? 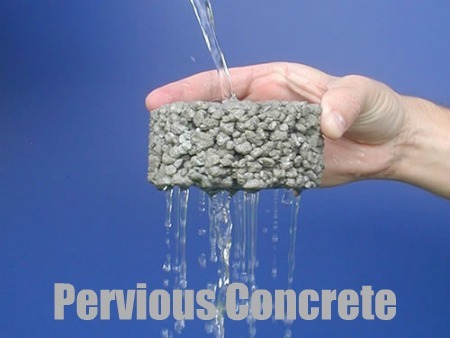 Pervious Concrete?? Did you know concrete can be designed to let water drain right through it? This kind of drainable concrete is great for parking lots, driveways, and anywhere storm water runoff can cause problems for a regular parking area. 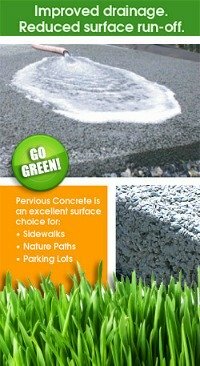 How is Pervious Concrete made? Pervious concrete is a mixture of coarse aggregate, Portland cement, water and little to no sand. A typical pervious (porous) concrete pavement has a 15-25% void structure and allows 3-8 gallons of water per minute to pass through each square foot. This permeable type of concrete is made with gap-graded aggregate, which means all the pieces are similar in size. This ensures that open spaces remain in the concrete, rather than being filled in with smaller coarse aggregate particles and fine aggregate. This will allow water to pass through freely, making pervious paved concrete a great alternative for large and small parking areas. Using gap-graded aggregate gives this "drainable" concrete an open surface that looks like popcorn and varies depending on the coarseness and type of aggregate used. For example, using 3/8 inch top-size aggregate allows the surface to remain open to water infiltration but dense enough to not cause problems for people walking with high heeled shoes. Using larger aggregate produces a more open surface allowing water to pass through more quickly. The type of aggregate used also effects both the surface appearance and its placement. Pervious made with crushed stone or other angular aggregate requires more compactive effort than that made with rounded aggregate. Mix design is a very important part of a successful pervious placement. 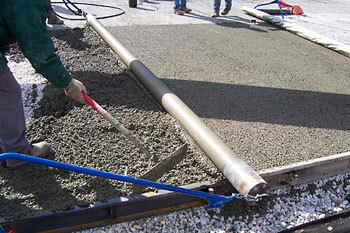 Adding too much cement to a pervious mix actually may weaken the final product. A mix with 3/8 inch aggregate may need about 400 to 500 pounds of cement per cubic yard of concrete, because the paste is most effective when it is no more than 0.015 inches thick. 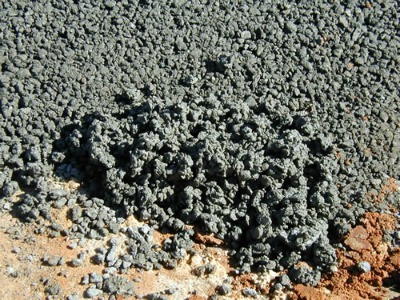 The best pervious mix is placed relatively dry and stiff but with a paste that is wet and sticky. The water to cement ratio is usually between 0.26 and 0.35, with low cement content, meaning the mix is quite dry. Adding a pound of 3/4 inch polypropylene fibers per cubic yard of concrete helps bond the coarse aggregate and wick water after the concrete hardens. Properly mixing the fibers in the dry concrete can sometimes be challenging. Balls of fiber as large as tennis balls may sometimes occur, just make sure they get pushed down to the bottom of the placement and no structural concerns will arise. Placing pervious (penetrable) concrete is straight forward and a relatively quick process. The basic steps are forming the edges, spreading the concrete, striking it off high and compacting it to grade, rolling in joints if desired, and curing. The steps go in rapid succession so make sure you have all the tools required and readily available. The goal is to place, compact and cover the concrete within 20 minutes so it doesn't dry out too quickly.